If you love the thrill of boating, fishing, swimming, sailing, and simply relaxing on the water, you can’t ask for a better place to be than Minnesota! What the area loses to a short summer, it more than makes up for with some of the most passionate anglers and boaters in the country. You’d be hard-pressed to find a single person in the county who hasn’t enjoyed Minnesota’s sky blue waters. With such an abundance of water and shoreline, don’t cha know Minnesota is destination playground for boaters around the country. Minnesota’s lakes and rivers are part of what this state is all about. One of Minnesota’s nicknames is “Land of 10,000 Lakes,” but it really has lots more. It’s on the shore of the biggest of the Great Lakes, Lake Superior. And, it’s where the world’s third largest river, the Mississippi, begins. Boating is one of the primary reasons people love Minnesota. It ranks among the top stress-relieving activities around. Here are some facts about Minnesota’s waters. Mississippi River: 680 miles of its 2,552 total miles flow through Minnesota. Lake Superior is the world’s largest freshwater lake. It’s at the end of the St. Lawrence Seaway, which brings boats from around the world to the port of Duluth, Minnesota. Skipping over state and country borders, Lake Superior, the largest, deepest, coldest, cleanest, least developed, and most pristine of the Great Lakes, reigns as the largest freshwater lake in the world by surface area. By volume, this 31,820 square mile colossus ranks fourth – a whopping 2,900 cubic miles (9,799,680,000 acre feet), or 400,000 gallons of water for every person on Earth. Today, these many acres are home to national parks, water sport activities, and myriad ways to pass the hours. Minnesota’s rivers and streams flow in three directions: north to Hudson Bay in Canada, east to the Atlantic Ocean, and south to the Gulf of Mexico. With that many boats out there, the enormity of Minnesota’s navigable waters and the popularity of the sport make a certain number of mishaps inevitable. With peak boating season underway, one of the most popular boating holidays of the year is also on the horizon – Labor Day. Labor Day has come to be celebrated by most Americans as the symbolic end of the summer. Many Minnesotans will be headed to the lakes. While boaters are always encouraged to enjoy their activities safely anytime when on the water, it is especially important during one of the busiest boating weekends of the year. Some boaters will be inexperienced, intoxicated or just plain careless. So it’s up to us to play it extra safe. Playing it safe includes being prepared. Boating accidents during the three summer holiday weekends represent between 15 to 20 percent of all accidents in a given year. So boaters are reminded to keep an eye out for safety as summer’s last big holiday – the Labor Day weekend – gets underway. The most important safe boating practices include: avoiding alcohol consumption while boating and always wearing a life jacket. Obeying the rules of the road, keeping a proper lookout and being responsible for the well being of all boat passengers are also important. Whether you’re a nautical novice or King Neptune himself, there is always a chance of getting in a boating accident. It happens! Make sure to watch your speed. Remember, you don’t have to go fast to have a good time. Just watch out for floating debris and submerged objects that can stop you cold. 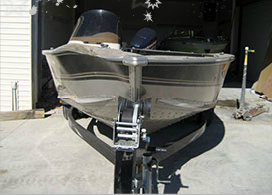 Debris often floats at or just below the surface, and hitting a log at high speed could result in anything from structural boat damage to serious injuries. It can also be really helpful to know where the shallow spots are. Like when you hit a rock and it shreds the propeller blades. 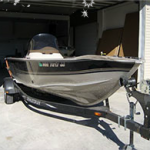 Your boat is a huge investment. The last thing you need is a boat collision that will keep you off the water and cost you a chunk of money. 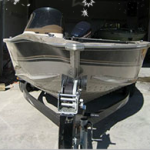 Yes, you may be an experienced boater, but even if you were born with tiller in hand, it’s worth taking a little extra time to make sure you’ve mastered the handling of this boat on this day under these conditions to avoid a boating accident. It’s important to pay attention! Safe boating requires good vision, good coordination and the ability to react swiftly. Boating traffic comes from all directions, and floating obstacles can suddenly appear without warning. Driving a boat requires the full attention of the operator, as there can be numerous distractions on the water. So do yourself a favor and make the lakes and waterways (and you) a little this Labor Day weekend by making safety a priority to ensure that boating stays fun! 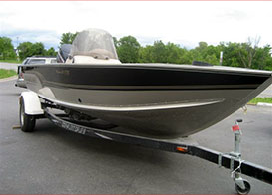 Boat Responsibly to avoid a boating accident! Different waterways have different risks. Completely different risks will present themselves during a trip down the Mississippi River compared to a trip out to the local lake. In short, be on the alert every second. Know the weather before you launch. If it’s stormy, delay your trip. 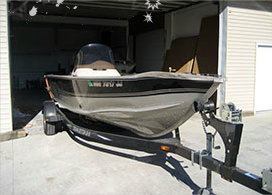 Pay attention for quick changes in the weather if you are out at sea or out on a mountain lake. Test your battery. It should be well charged. Check your engine. Have enough fuel for your trip plus a spare gallon or two in case you need to assist another boater. Have enough life jackets. In Minnesota, the law requires a life jacket of the appropriate size for each passenger. I hope you will keep these tips for Labor Day boating safety in mind as you prepare for your trip out on the water on the last long weekend of summer. Be extra safe and have extra fun. 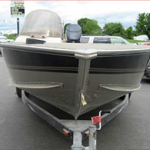 This is one example of what can and does happen when boaters hit the water! And when it does, you want the assurance that your boat will be restored to its original beauty. 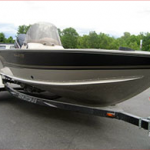 Repairs should be done by a professional Minnesota boat repair expert to ensure the boat is a seaworthy vessel. This boat hit a steel object in water. Damage was cutout; new aluminum was welded in place. The body work was performed and a new coat of paint was applied. 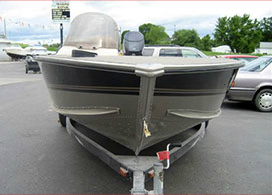 As you can see the boat was returned to its pre-accident condition.